By Rev. Ray Corriveau, C.Ss.R. One of the Redemptorist themes, formulated by the 1985 General Chapters, is “to evangelize the poor and to be evangelized by the poor.” Clement, with his peasant beginnings in Moravia and his own experiences of poverty, already had this Redemptorist stamp imprinted on him, which made him so much at home with the Redemptorists. It was said of him that in Vienna, “he worked among the great to gain permission to work among the very poor.” Especially responsive to the poor, his rooms in Vienna became known as ‘the convent for the beggars.” In the midst of a war-torn era, he made it a special ministry to minister to the sick and the dying. From the time of St. Benno’s, the sacrament of penance was a principal pastoral focus for him and his community. Once in Vienna, Clement gradually became a spiritual director and counselor for people from all social classes. Believing in the basic goodness of people, he loved sinners and approached them with compassion. He always strove to encourage the guilty persons and to awaken noble sentiments in them. His pastoral work in the confessional and his one-on-one conversations had a broad and in-depth effect. 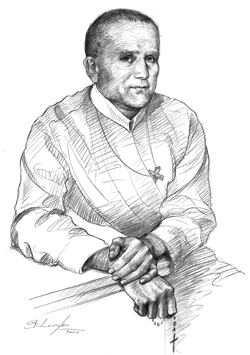 It is said of him “that he brought about the majority of conversions as confessor.” Again, at testimonial at his beatification process: “His knowledge of human nature in the confessional was wonderful; it was not a result of art but rather a gift from above.” While listening to sinners he seemed entirely lost in God such that his counsels came from the depth of the heart to reach the heart. May St. Clement continue to keep us, as Redemptorists, faithful to our mission, nurturing in us a closeness to people, especially the marginalized and the most abandoned. Father Corriveau, a member of the Edmonton-Toronto Province, died in 2010. His last assignment was as associate novice director at the Redemptorists’ North American Novitiate.